We’ve always had a lot of luck with restaurants that have “numbers” in their name. No. 246 in Decatur, Five and Ten in Athens, Nine St. Kitchen in Roswell, and 61 Main in Jasper are just a few of the “numbered” places that we have visited in the last six months. 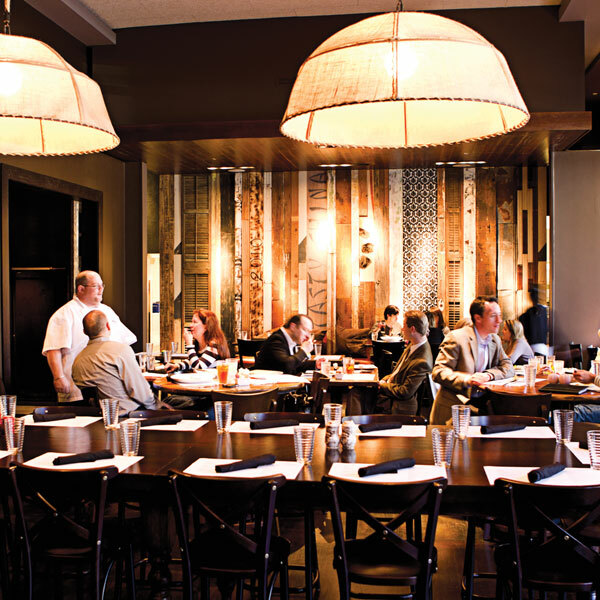 For Date Night #46, we visit Local Three, which is hidden in an office park/condo complex on Northside Parkway. Local Three decor. Full disclosure: we forgot to take this picture, so I stole it off of the internet. Back to the present, though as it is time to order beer. Cocktail lovers will be pleased to know that the bar menu is many pages long, but we are beer people and study the two pages of beer choices intently. One page is the drafts and the next page has a lot of bottled exotic, high-alcohol Belgian beers. 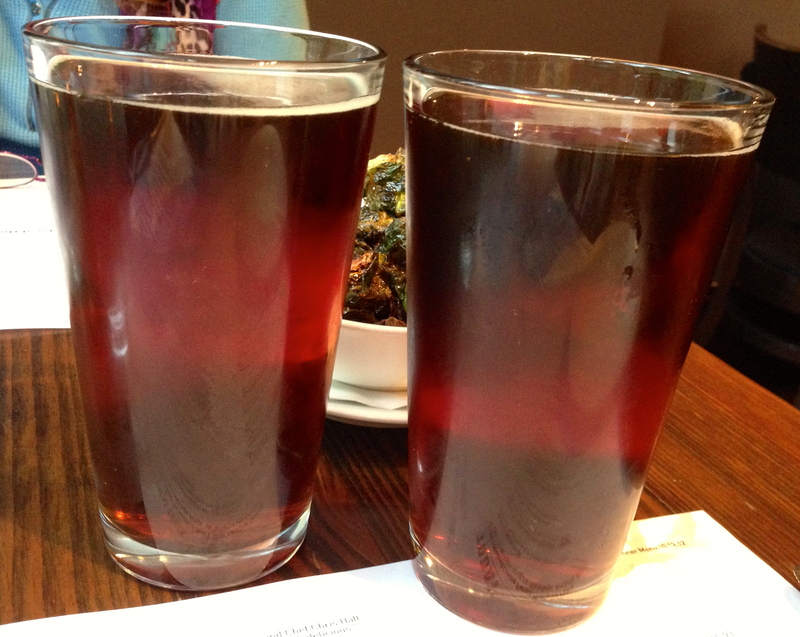 The Belgians are tempting, but we both get the same thing, the Monday Night Drafty Scottish Kilt Ale. Monday Night is one of Atlanta’s newest breweries. They will be opening up a tasting room in the next few months, so look for us there when they debut. There are small plates and large plates on the menu, which doubles as our placemat. 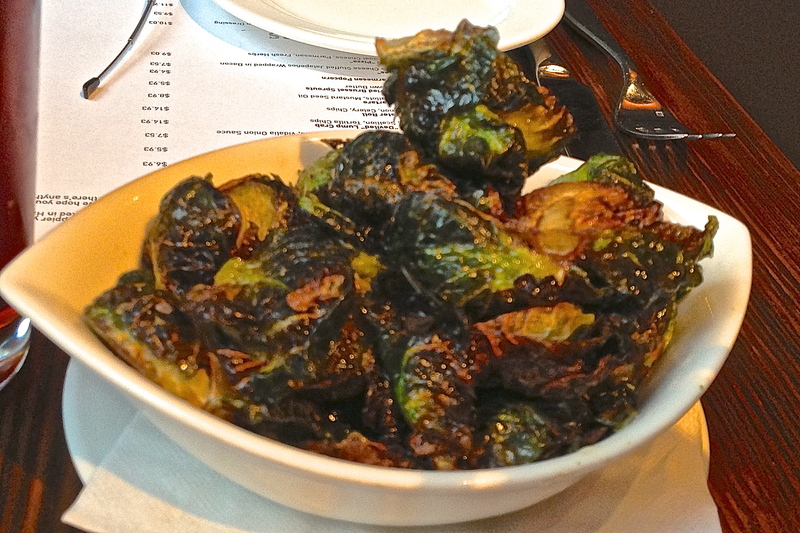 We decide to go small plate tonight, starting with…brussel sprouts. Best brussel sprouts ever! Really! Brussel sprouts? I am not a fan at all, but these are amazing. They are cooked in duck fat and don’t taste anything like the vegetable that we all hated as a child. I could have ordered another plate of them, but we have more food coming. 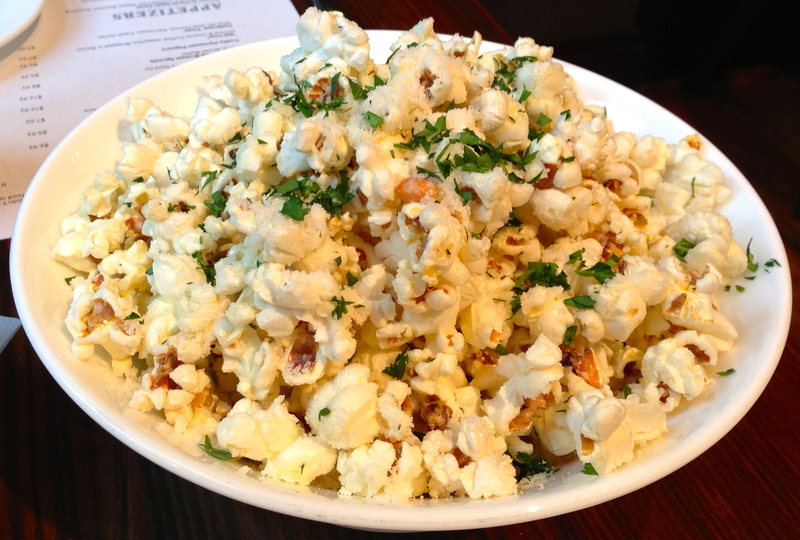 Like this parmesan truffle popcorn, which did not last long in the bowl. They must put something on the popcorn that’s illegal, because once you start eating it, you can’t stop. The bowl is soon empty. Local Three has a cheese platter and a meat platter and you can combine two from each to make your own platter. We make our own with sheep’s milk cheese from California and cow’s milk cheese from Wisconsin. As an aside, we visited the Wisconsin cheese factory over the summer. The meat platter is more adventurous, with porchetta (the meat from the hog jowls) and caramelized fennel and apple sausage. The porchetta is a bit too fatty for Eve, but it was good with the violet mustard that came with it. Local Three has a section on their menu called “Today”, which is food that you can only get that day. Mushroom “lasagna”. A daily special. 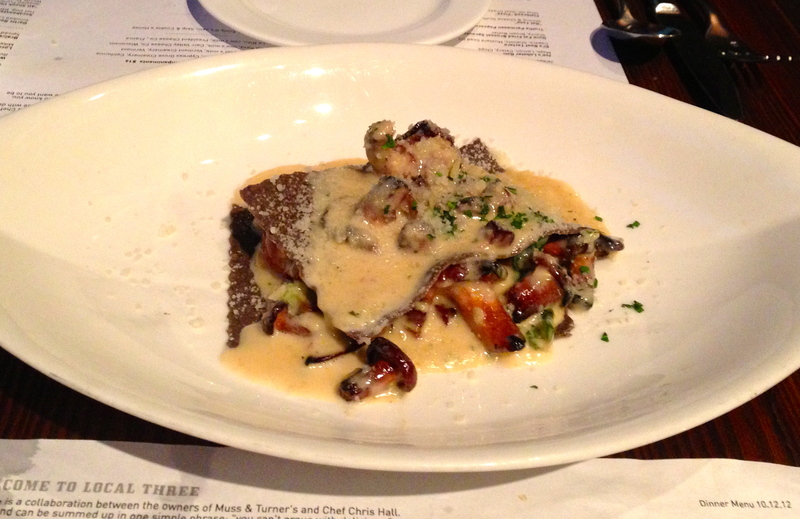 We get the chantrelle mushroom “lasagna”. There is bacon in there and greens. The “pasta” is actually made from buckwheat and isn’t pasta at all. This is a great combination of flavors. We have our waiter, Nicholas, bring us some bread to sop up the remaining lemon-parmesan sauce. And speaking of Nicholas, he is great. He has incredible knowledge of the menu and has eaten everything on it. His suggestions help us make good choices when we are having trouble choosing because of the great menu selection. We have one more thing to select, and that is dessert. How about the caramel apple? Doesn’t look like apple pie, but tastes just like it. 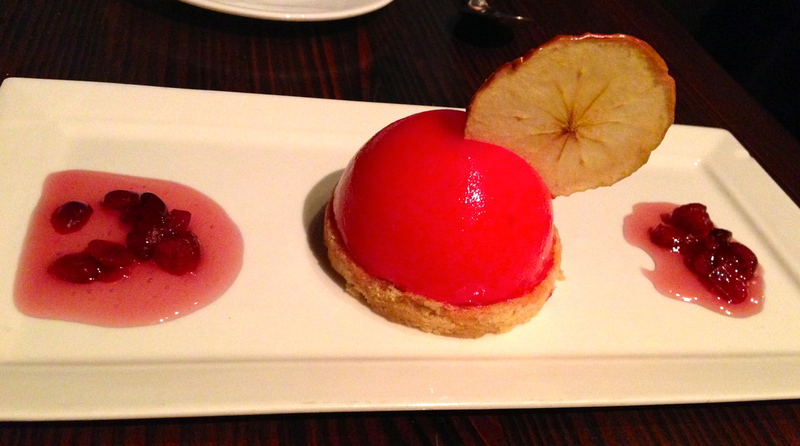 This is caramel mousse with an apple filling. It tastes like apple pie and looks like a red apple. This great presentation is a wonderful way to end our meal. We leave Local Three knowing that we didn’t make a dent in everything that we wanted to taste on the menu. Like Arnold Schwarzenegger, “we’ll be back”!